Sneezing is a common and natural mechanism, especially in cold weather. In some places, this behavior is considered impolite; it makes people feel uncomfortable, especially if you do not have a tissue available. However, many people want to stop sneezing for different causes. 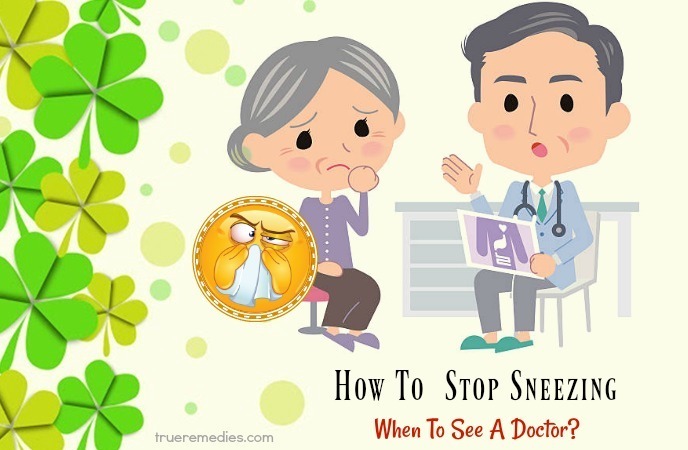 I know that the reason you are reading this article of 26 Tips On How To Stop Sneezing So Much Quickly is to knowhow to quickly treat this problem, that is also what many people want. But before that, you had better understand some information about it. Therefore, you can deal with it in the right way. Sneezing is a mechanism of the body that you can hardly control. When people want to sneeze, restraint is very difficult. Usually, most people only sneeze once, but some people have to sneeze twice or even three times in a row. That is normal physiological phenomena. This constant sneeze also depends on the sensitivity of the nerve cell in each person’s nose. In fact, there are people who just rub the nose gently and can sneeze, even from 10 to 15 times in a row, but on the other hand, there are many people who rarely experience this phenomenal. However, if constant sneezing makes you feel uncomfortable, this condition is no longer a normal physiological phenomenon, but it can be a sign of a condition related to ear, nose and throat. Persons with continuous sneezing should go to the clinic for specialist diagnosis and treatment in time. Some researchers used a laser to take pictures of sneezers and found that when you sneeze, there are thousands of tiny drops of water that come out of your mouth at a speed of 116.7 km / h. They can be thrown 3 or 4 meters away. So, when a person who is carrying a disease or germs causes a sudden sneezing illness, they are very likely to spread the disease to others. Continuous sneezing can be a sign of allergic rhinitis. Allergic rhinitis can be directly related to the environment in which you work and live, or your diet. If allergens persist in the environment and in the food, the patient will immediately have a sneeze. What Are Common Causes Of Sneezing? Many people have seasonal allergies so they often have continuous sneezing. Some people are allergic to internal agents, but others are sensitive to stimulants from the external environment. The most common agents in winter which usually cause allergies are damp, mustiness and humid dust. We often think that colds can only happen in the winter, but it can happen at any time of the year. When you have a cold, sneezing may be one of the initial symptoms. In addition, nasal polyps can also cause continuous sneezing. Allergy to pet hair such as dog or cat hair does not only occur in young children but also in adults. This condition will cause continuous sneezing. Some people are very sensitive to perfume. So when they smell the fragrance of some perfumes, they start to sneeze, because their nasal cavity is inflamed. If you are constantly exposed to frost and air pollution, you are also more likely to have continuous sneezing, as these factors can strongly trigger your nose. Excessive temperature changes can cause sneezing. Even though the weather is about to change, many people can sneeze continuously. In addition, climate change as well as the use of air conditioning also increases the number of people who suffer from frequent sneezing. Tobacco smoke can trigger your nose to sneeze. If you are exposed to tobacco smoke, it is very likely that you will sneeze continuously. You may be allergic to certain stimulants, which causes you to constantly sneeze if you come into contact with them. Sneezing occurs when the mucous membrane is affected by factors such as cold, stimulants (dust, spicy onion, pepper, perfume, pollen, hair dye, laundry detergent, fabric…). There are some people who have sneezing after a meal, especially after eating spicy foods. If you are taking a certain medication, your body may have an allergic reaction to it, causing symptoms such as sneezing. If that really is the cause, you need to change other medicines as directed by your doctor. Sunlight can also be a common cause of sneezing. These are people with sneeze syndrome and this syndrome is inherited from parents to children. What Are Common Symptoms Of Sneezing? If you have seasonal allergies, the symptoms that you are most likely to get from this condition include constant sneezing, nasal congestion, runny nose, and itchy eyes, nose, throat and sometimes on the palate. Some more severe symptoms may include infections, insomnia, and difficulty in getting and concentrating. The patient is most susceptible to asthma if these symptoms are not resolved. In addition, you may also have some symptoms such as stuffy nose (runny nose makes the nose stuffy, so many people have to breathe through the mouth), itchy nose and eyes (this is the most common early sign of a cold), and pain in the head and ribs. Some symptoms may be associated with sneezing such as sore throat, tinnitus, decreased sense of smell, discomfort and fatigue. Anyone can get into this situation, especially when it’s cold. However, people with seasonal allergies and people living in polluted environments are often at high risk for this condition.You can control this problem by minimizing risk factors. Please see your doctor for more information. Sneezing is not a serious condition, but if you have constant sneezing, you should see a doctor for direct examination and counseling. 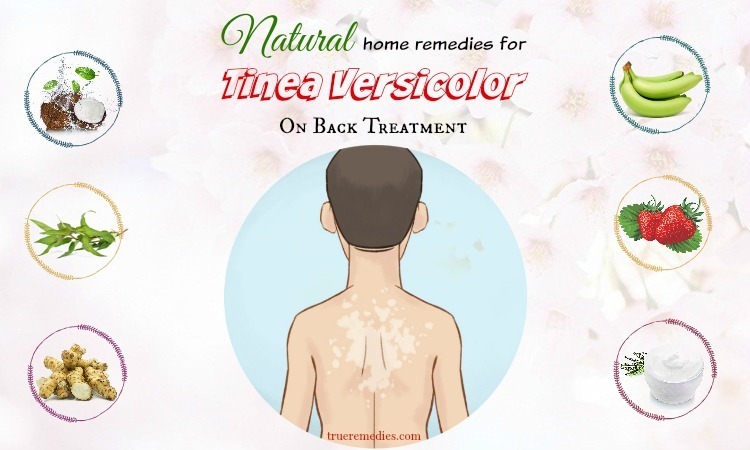 Not only that, if after a period of home treatment but no results, you should also see a doctor to determine your exact condition.Besides, if you have any questions, please consult your doctor. Each person’s condition is different, so please consult your doctor to select the most suitable option. Above is the information on sneezing that you should know. 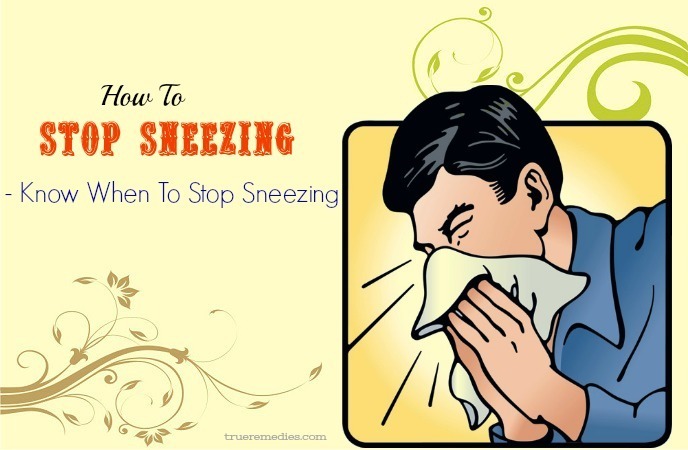 It is time to find out what the best tips on how to stop sneezing so much quickly are. Take a look at TrueRemedies.com! Squeezing your nose: squeeze the top of the nose and pull it out as you would like to remove the nose from the face. This can be painful, but you can prevent sneezing by simply stretching the cartilage of your nose. Blow your nose: use a towel when you feel you are about to sneeze. Blowing the nose helps to clean the nasal cavity, eliminating the cause of sneezing. Pinch the upper lip: use your thumb and index finger to pinch your upper lip and press up toward the nostril. The thumb is pointing toward one of the nostrils, the index finger is pointing toward the other. Use tongue: squeeze the tongue behind the two front teeth. Try squeezing your tongue into your teeth until you no longer feel the need to sneeze. Stop, stoop and wait: find a small table in the house, bend down about 2.5 cm from the table and stick out tongue. Sneeze will naturally disappear in 5-7 seconds. Make yourself tickle: use your tongue to tickle your palate when you feel you want to sneeze. Continue until the sneeze disappears. This can take 5-10 seconds. Pinch to the point between the two eyebrows: this is the point where people press to relieve headaches, and it also prevents sneezes. Use your thumb and index finger to pinch between the two eyebrows until you no longer feel the need to sneeze. Press on a point under the nose: using the index finger (hold your finger below the eye), press on the cartilage of the nose. This action will clamp one of the nerves that stimulate the sneeze. As a result, the sneeze will quickly disappear. Lightly impact the ear: grip the ear lobes and move lightly when you feel you are about to sneeze. This gesture can be camouflaged as if you are touching the earring when you try to stop the sneeze in public. Make an angry expression: clench your teeth but try to stretch your tongue (press muscles behind the front teeth). Press as strong as possible! Stimulation can prevent sneezing. 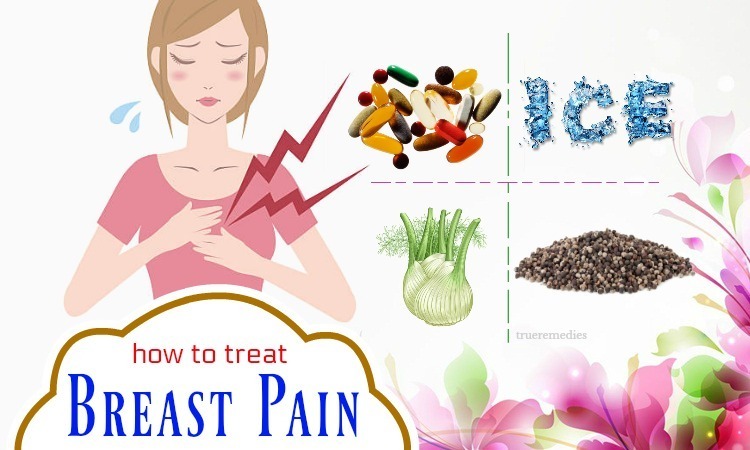 Use black fennel seed: you can buy this kind of seed at a vitamin / herbal store. Use a clean cloth to wrap a handful of this seed, then roll it in the palm of the hand to break the seeds. Bring it up near the nose and smell its aroma. Sneeze will disappear! When you are about to sneeze, try to say the words start with the letter P as the word “battery”. This can also make you no longer want to sneeze. This is another must-try treatment in this list of tips on how to stop sneezing so much. If you are curious to know, the word ‘snatiation’ is a recapitulation of the first letters of the phrase “Sneezing Non-controllably At the Time of Indulgence of the Appetite-a Trait Inherited and Ordained to be Named”. Its origin is a combination of sneeze and satiation. Right, actually there is a medical disorder in that you cannot stop sneezing because your stomach is full. This usually happens after a full meal. Then how to avoid? Do not eat too much. Limiting exposure to intense sunlight is one of little – known tips on how to stop sneezing so much. You may need to determine if you are frequently sneezing when exposed to the sun. If you notice that you are constantly sneezing when exposed to intense light, you may need to limit exposure to these types of light. This phenomenon occurs in 18-35% of the population and is sometimes referred to as ACHOO syndrome (autosomal dominant compelling helio-ophthalmic outburst syndrome). This syndrome is inherited and can be treated with antihistamines if it causes discomfort to your life. You can wear sunglasses (especially divergent lenses) or scarves to limit this condition. When the light is too intense, turn your eyes away and focus on darker places. This is even more important if you are driving. This is the next treatment in this list of tips on how to stop sneezing so much that you should try at least once. If you are about to enter a sneezing-prone environment (such as pepper or pollen), take precautions to avoid sneezing. You should also bring paper towels. Sneezes and blows usually go hand in hand. You can also find ways to moisten your nostrils. This can prevent sneezes before they happen. You can use a wet towel to apply on the nostrils, apply eye drops to the nose, or breathe steam from a hot cup. All of this is simple but very useful. If you have frequent sneezing, you may be mildly allergic to certain environmental factors. In addition to seeing your doctor, pay close attention to allergic reactions. Sneezes can be prevented significantly. When staying at home or while driving, close the doors so that the factors of the environment do not affect you. If you are outdoors for a long time, you need to take a bath and change clothes. Besides, you can take antihistamines. These drugs not only prevent sneezing, they also reduce cough, runny nose and itchy eyes. Benadryl is known to cause drowsiness, but other drugs like Claritin have far fewer side effects. This sounds strange when it comes to tips on how to stop sneezing so much, but it works. Sneezing is a coping mechanism of the body. Normally, a sneeze can push the air out of the body at speeds up to 160 km / h, a very high speed. Therefore, it can hurt the body if it is blocked improperly. Therefore, do not stop the sneeze when it is happening if you do not want to experience any injury. You should only stop it as soon as you notice the signs that you are about to sneeze. For example, do not squeeze your nose or mouth while sneezing. This can cause serious injury to the body. Without being released from the body, the force and speed of the sneeze can cause hearing loss and damaged blood vessels in the head. If you have a habit of stopping sneeze while it is happening, you have a higher risk of getting these problems. Surprisingly, some people have broken ribs just because they tried to stop sneezing when it was going on. Besides, if you have a broken rib, a sneeze can make you feel very hurt. Try to breathe all the air out of the lungs. This will reduce the pressure placed on the ribs and cause a significant reduction in sneezing, thereby reducing the pain. This is the next one in this list of tips on how to stop sneezing quickly. When there are many people near you, you can spread harmful bacteria when you sneeze once (or two, three, even four times) into the air. Sneezes can push the air to 1.5 meters. This range can cover many people. So be careful! If possible, sneeze on the tissue and throw it away. If you do not have a tissue available, you should sneeze into the sleeves. If you have a sneeze, you should be careful about spreading the disease. Currently, many doctors advise people to sneeze on the inside of their elbow rather than sneeze into the palm of their hands to prevent germs from spreading. Besides, if you sneeze into the palm of your hand, you must remember to wash your hands immediately afterwards. Hands often touch the door handles, faces, surfaces and even others. If you happen to be away from the water, be sure to bring hand washing liquid to use when needed. So how to sneeze politely? When you’re in the crowd, you’re sure to receive angry eyes from others if you sneeze too much. You are spreading germs and interrupting events, so it’s best to sneeze as closely as possible. Sneezing into the elbow can reduce the sound. If you do not want to sneeze into your elbow, take a tissue, bow down and sneeze as small as possible. You can add 1-2 teaspoons of lemon juice to add flavor to this tea. Every day, drink 1-2 cups of warm honey tea, even if your condition has been eliminated. It is very good for your health. You can also add a little honey if you want. Drink this tea in the morning to quickly relieve constant sneezing caused by a cold. You can take 1-2 cups of ginger tea per day, but do not drink this tea at night before going to bed. Ginger can cause indigestion. Ginger does a good job in reducing your sneezing episodes. It has potent anti-inflammatory along with other properties, helping with diabetes control, weight management, pain relief, and sneezing reduction, etc. According to a new research, it was found that adding ginger compounds to isoproterenol, which is a kind of asthma medication, could promote its bronchodilating effects, thereby opening the airways. This pale yellow-hued root also does it wonders via its anti-histaminic properties. As a result, it prevents your airways from contracting and relieves sneezing. You can take advantage of fresh ginger by consuming it raw or make a concoction by combining it with honey and drinking it. If you have a sore throat or cold associated with sneezing, then ginger is definitely the best choice to kick them away. Fight off sneezing, particularly if it is triggered by the respiratory tract infection. This seed is jam packed with antiseptic, anti-histaminic and antibiotic properties, so it could help with sneezing. Mix fennel seeds with ginger to stop your sneezing symptoms. As an alternative, simmer about 2 tablespoons of crushed fennel seeds in plain water, then strain before adding honey to sweeten this strong brew. Sip the tea for an instant relief. 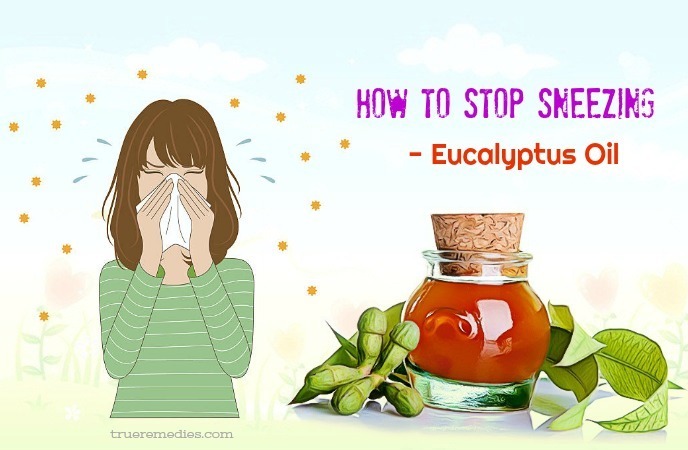 When it comes to best tips on how to stop sneezing so much quickly, think of eucalyptus oil. This is really a rescue if your problem is triggered by nasal congestion or allergy because of dust  . Also called as petrolatum, petroleum jelly is a mixture of waxes and mineral oils, forming a semisolid jelly-like substance. 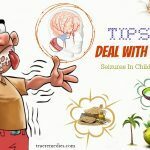 It is a time-tested home remedy on how to stop sneezing for both children and adults. Simply use your clean hands to apply some petroleum jelly inside your nasal passage. This will help moisturize your dried passages, thereby preventing sneezing. Some people might be more sensitive and could develop allergies if using petroleum-derived products. Thus, you should keep an eye out for possible irritations and adverse reactions upon using a new product. Inhaling mineral oils might lead to aspiration pneumonia. Fenugreek seeds, aka methi seeds, are tiny, golden brown seeds with anti-inflammatory, anti-histaminic and antibacterial properties. They are one of the oldest medicinal plants known to the human and has been widely used for hundreds of years in Eastern and Western herbal medicine. 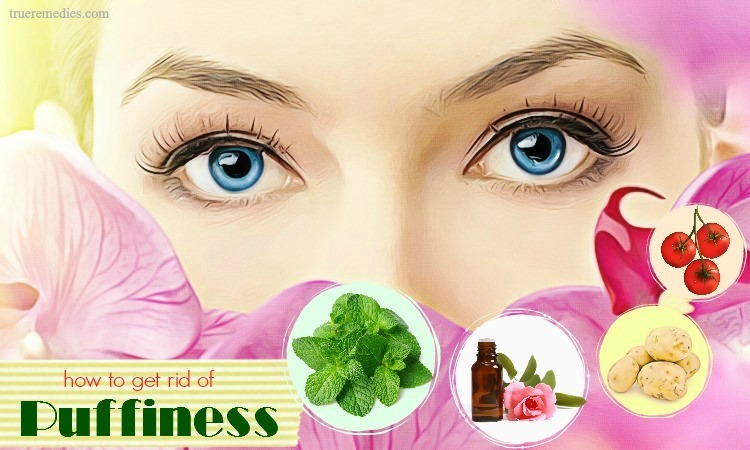 Thus, their properties make them a great solution for tiding through the irritating spells caused by sinusitis. The tea made from fenugreek seeds has been used for a long period to handle lung disease like asthma or bronchitis. Tamarind is a sweet, delicious and sour fruit with various uses, ranging from culinary to medicinal purposes. The health benefits of tamarind have been well-studied, including reducing inflammation, improving vision, healing skin conditions, improving digestive system and boosting respiratory health. Thus, it is listed as one of little-known ways on how to stop sneezing. 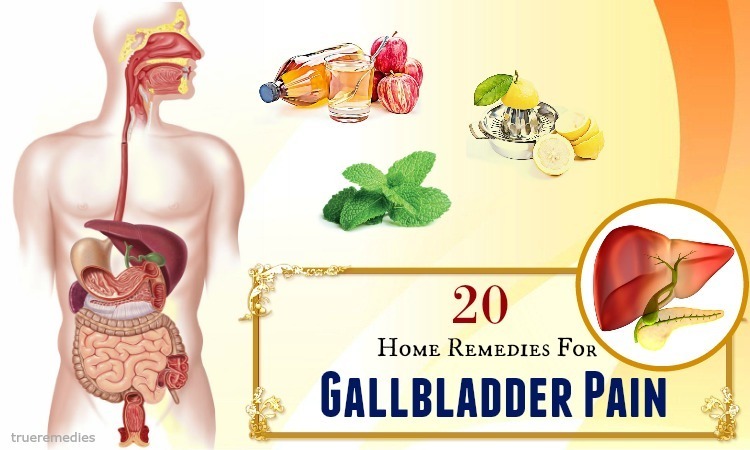 Its benefits are amazing, particularly if combined with black pepper powder. Amla is one of the most important herbs in Ayurvedic medicine thanks to its incredible health benefits. 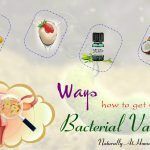 In details, it is packed with antibacterial properties and antioxidants, thereby improving the immune system to work against a runny nose and sneezing. Intake of amla juice has been traditionally used to improve respiratory health like asthma and sneezing. It is because this herb could soothe inflammation and pinpoint the underlying infections in respiratory tracts. This herb could be consumed in the raw form or mixture with honey and hot water for good results. Also known as holy basil, tulsi is considered among the best natural remedies for cold-related issues, including sneezing. With powerful antibacterial properties, tulsi could ward off infections quickly. Besides, the strong healing effects of this herb make it potential to warming up the human body from inside and handle respiratory problems. You can either chew tulsi in the raw form with jiggery daily morning to prevent colds or make a tea from this herb. Simply add 3-4 leaves of tulsi in a cup of hot water, followed by honey, then consume regularly for best results. A few centuries ago, licorice root was commonly used in China, Egypt, and Greece for upper respiratory and stomach inflammation problems. Today, this herb is used as a dietary supplement for menopausal symptoms, digestive problems, cough, and viral and bacterial infections. For respiratory problems, licorice helps to eliminate mucus, prevent congestion, and decrease inflammation in the respiratory tract and sinuses associated with allergies. Straight licorice root teas are usually available at the health food stores, but it is also widely used as an ingredient in a lot of homemade teas. Alternatively, you could also take capsules containing dried licorice root. Similar to any herb, as with any medication, moderately using always yields the best effects whilst minimizing the potential side effects. If overused, licorice may increase blood pressure and reduce potassium levels. People with hypertension should consult their healthcare provider prior to taking this herb as a supplement. The fruits such as orange and lemon have a rich content of vitamin C – a natural anti-histamine – and flavonoids. So, these fruits can strengthen our immune system to fight off common cold, allergies, and flu. Therefore, it is recommended drinking natural citrus fruit juices to eliminate sneezing at its root. Despite this spice is majorly used thanks to its aroma, its effectiveness in reducing mucus flow in the respiratory tract is also appreciated. 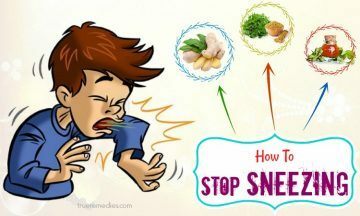 That is why black cardamom is mentioned in this list of tips on how to stop sneezing sensation quickly. You can massage with cardamom oil regularly to soothe your nasal cavity and improve your condition. 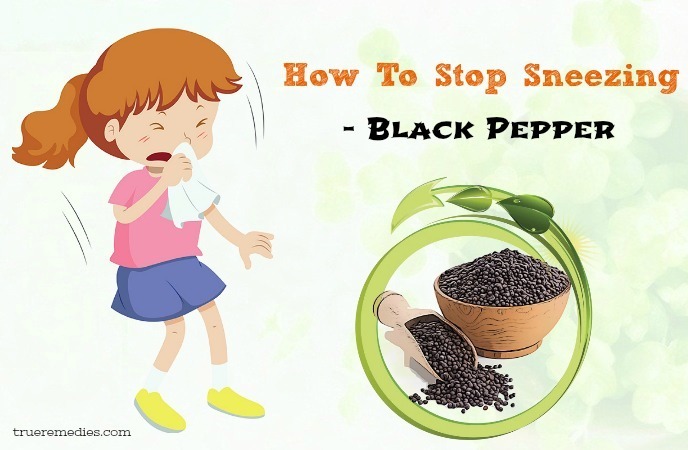 Being an anti-bacterial agent in nature, black pepper mixed with honey can do a trick for sneezing relief. It lessens chest congestion caused by pollution, viral infections or flu. You can add black pepper to hot water, followed by eucalyptus oil. Then, take it as steam. Alternatively, you could add pepper to warm water, and gargling with this solution to remove germs and cold viruses. This might sound scary, but stinging nettle is one of the most efficient herbs for allergy removal. The main actions against allergies are reducing inflammation and histamine production  . Basically, histamine is a substance released when people contact with an allergen. It is responsible for the runny nose, itching, red eyes, and other symptoms associated with allergies. To use this herb, you should make use of it in the tea form. Buy dried leaves, then steep them in the boiling water. Black elderberry is beneficial for allergy symptoms (including sneezing) rather than allergies themselves. Nonetheless, it can improve the immune system, reducing the severity of allergies in some cases. Black elderberry can lessen the congestion coming with allergies. As a result, it alleviates coughs that happen when the human body is trying to remove congestion. Simply make black elderberry tea to soothe your throat and relieve coughing and congestion. Do it by steeping some flowers of black elderberry, adding raw honey for flavor and having it at regular intervals. You had better consult a professional herbalist to know the precise dosing and administration instructions. The quercetin content of bilberry makes this herb powerful towards allergies. Quercetin is a substance with the ability of blocking histamine release, thereby preventing allergy symptoms  . You should take bilberry daily during the summer and spring as it majorly works as a preventative measure to keep allergies at bay. The herbalist could help you decide the right dosage because it is different for everybody and should be modified according to the severity of your allergy symptoms. You can take advantage of bilberry for sneezing relief through the tea or capsule form. Add this herb to boiling water and leave it there for 15 minutes. Add some honey to flavor it. Drink regularly to soothe your throat. Rinsing your nose with diluted saline solution is the next remedy in this list of tips on how to stop sneezing sensation. You can use diluted saline solution or physiological saline to clean your nose every day  . 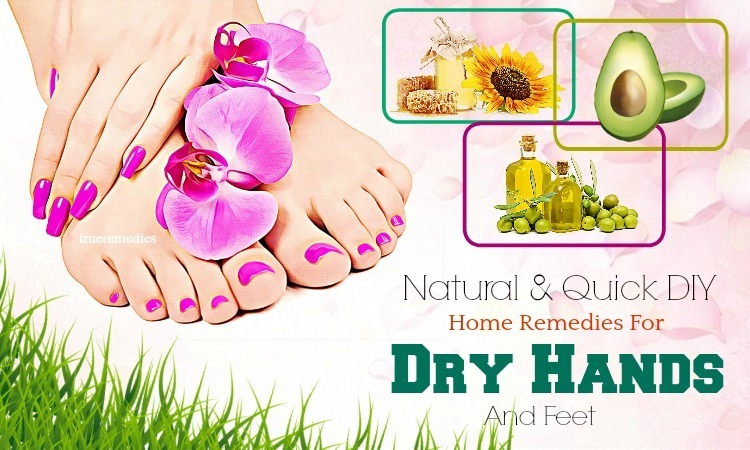 This can remove the irritation of the nose, help the nose always be clean. If you have constant sneezing due to colds, you should apply this tip. You can use neti pot to make this easier. Let’s apply this tip every day to get the best results. Put the tongue at the gum palate or alveolar ridge meets the mouth roof. Pinch in this site, which has a nerve responsible for triggering sneezing. Avoid contact with nasal irritation agents such as animal hair, pollen, strange odors, and cigarette smoke. Establish and maintain a scientific lifestyle. Supplement foods rich in vitamin C such as oranges, cabbage, tomatoes and kale. Regularly do exercise to strengthen the immune system. Above are tips to help you stop sneezing that you can quickly apply. As you can see, they are all very simple and safe. So, let’s apply some of them to see how effective they are. If you have any contributing ideas about our article of “Top 26 Tips On How To Stop Sneezing So Much Quickly” introduced in How To Category, do not hesitate to drop your words below this post. We will answer as soon as we could.